In recent years, Atlantic Theatre Artistic Director Neil Pepe has been with his theatre's co-founder David Mamet through thick and through thin. And for that, I'm grateful, given the works Pepe has breathed exciting new life into. 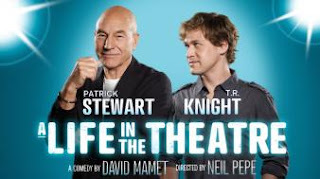 But nothing has been nearly as thin as Mamet's A Life In The Theatre, a mildly amusing, intermittently humorous and even potentially poignant play about two actors at the opposite ends of their careers. If this work was a real life, you'd think it had overdosed on plavix, making its blood so thin that its veins are left as brittle as Mamet's surprisingly stilted dialogue -- an unfortunate coincidence that has rendered this inert revival as surprisingly lifeless. How thin can this show be? Running at an exasperatingly long 90 minutes, A Life In The Theatre is divided into dozens of short, distinctive vignettes punctuated by what seems like at least 15 minutes worth of changes in scenery. In fact, Santo Loquasto's scenic design and the stage hands who move it essentially become this revival's third character. All of what little action there is takes place in the same theatre. However, it's drawn out over an endless, if unlikely, series of plays in which both Robert (Patrick Stewart) and John (T.R. Knight) are continually cast opposite one another. At first, budding thespian John seems eager to accept the sage advice of Robert, an actor in the twilight of his career. The interplay between Stewart and Knight is at its best when the two are backstage, even if most of the play's funniest moments are reserved for the mishaps onstage. What makes A Life In The Theatre particularly thin is that Mamet never seems interested in going beyond the superficial relationship between the two actors. Beyond painting one actor's ascent and the resulting jealousies of the other, Mamet misses the opportunity to explore who these men beneath the greasepaint are. Leaving them rather one-dimensional, Mamet deprives the audience the chance to become invested in who Robert and John are. There is A Life In The Theatre lurking somewhere in this revival, but it's pulse is just too faint. Down The Rabbit Hole Again. This Time On Film.